On Feb. 28, 1995, Denver International Airport (DEN) opened to the public and captured the world’s attention with its striking tented roof structure and technologically advanced operations. (Read the original 1995 souvenir guide here!) Twenty years later, the airport has established itself as the number one economic driver and job creator in the region. 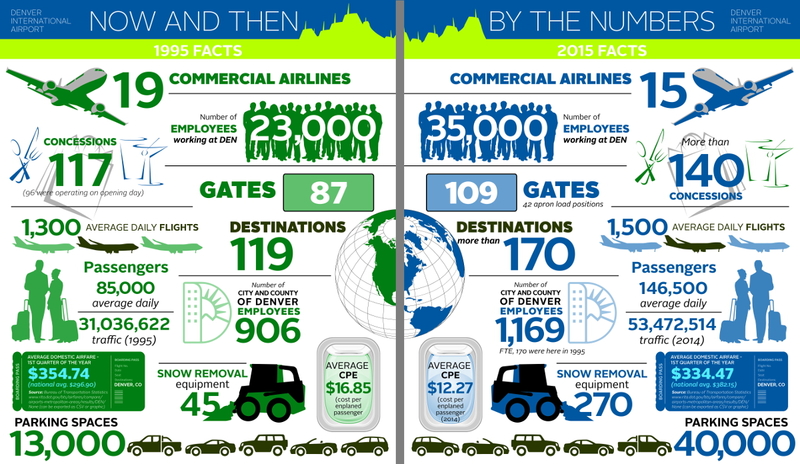 Here's a look at DEN's operations and economic impacts in 1995 and in 2015. The first major new airport to be built in the United States in 20 years, DIA has grown from serving 31 million passengers in 1995 to an all-time record of 53.4 million passengers in 2014. Today, DIA generates more than $26 billion in annual economic impact for Colorado and supports nearly 190,000 jobs. It remains the largest and newest commercial airport in the United States, with room to double its current capacity to remain competitive in the growing global aviation marketplace. The East Rail line is a 22.8-mile commuter rail transit corridor that will operate between Union Station and Denver International Airport. The rail line will connect these two important areas while serving adjacent employment centers, neighborhoods and development areas in Denver and Aurora. The East Rail Line is being constructed as part of the fully funded Eagle P3 Project. 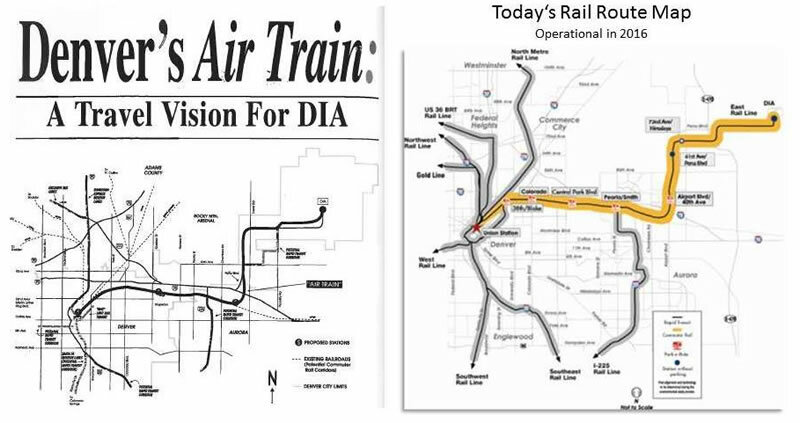 The map on the left shows the imagined rail line as envisioned in 1995. The map on the right shows the final route that will open in 2016. Learn more about the rail line here. The Westin Denver International Airport is a modern, convenient destination for both business and leisure travelers at Denver International Airport. The hotel is part of the new Hotel and Transit Center, which also comprises an outdoor plaza and a public transit center with rail service to downtown. Sscheduled to open this November, the hotel will complete the original vision for the airport. Each of the 519 guest rooms, including 35 suites, offers the ultimate in comfort and technology, plus floor-to-ceiling windows with sweeping views of the Rocky Mountains or Colorado’s enchanting landscape. These contemporary accommodations provide guests with thoughtful, distinctive amenities, such as our signature Heavenly® Bed and Heavenly® Bath. With sleek design by Gensler, including eye-catching glass curtain walls, our hotel boasts a range of world-class amenities. Reinvigorate in the WestinWORKOUT® Fitness Studio, and refresh in the indoor swimming pool. Multiple dining venues serve a variety of cuisines and SuperFoodsRx™ options. Totaling 37,500 square feet of elite function space, the conference center is the perfect location for your next business meeting or social event.